One of the best things about going on holiday is the chance to try some delicious new food. As a child our family holidays were always in the UK so new culinary experiences were few and far between, but nevertheless there are plenty of dishes that I associate with those happy weeks in the great British summertime: hot, sugary doughnuts at Flamingo Land, fish and chips at Scarborough beach, and Greek salad at the country club in Center Parcs. 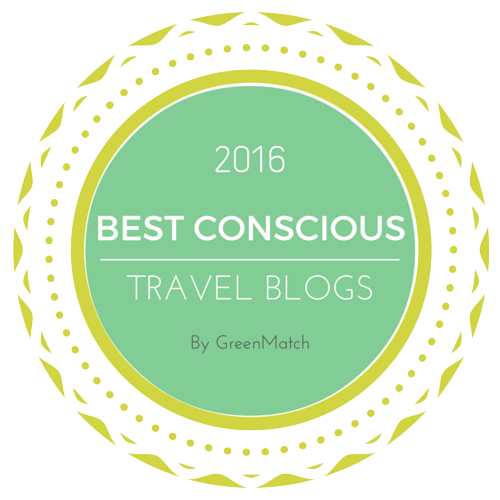 Some of my happiest memories are from family holidays in Sherwood Forest, our regular holiday destination when my brother and I were in our teens. Alongside recollections of various sporting activities and the incredible pool, I always remember the food and drink. An amazing Dime Bar cake at the American restaurant when we had my birthday meal there one year; the hot chocolate in Chez Pierre; chips and cocktails by the pool; and the aforementioned Greek salad. I was never a big believer in salad as a main course, but my mum ordered this and it looked so fresh and delicious, and I was always a fan of feta cheese, so I gave it a go myself too, and I’m glad I did. 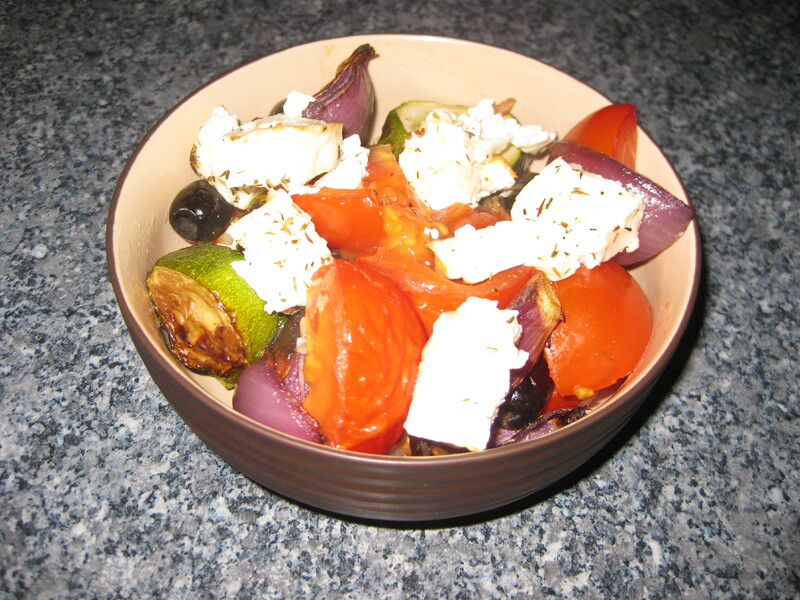 Now I still love Greek salad, but generally stick to this delicious roasted variety. It’s colourful, reasonably healthy and extremely tasty. I usually make it with smallish red onions cut into wedges, but this time I had pearl onions to use up. While I find bigger onions a bit overwhelming on the taste buds at times, I do think it looks more appetising with the vibrant purple more visisble in the bowl. Either way, it’s an absolute treat. 1. 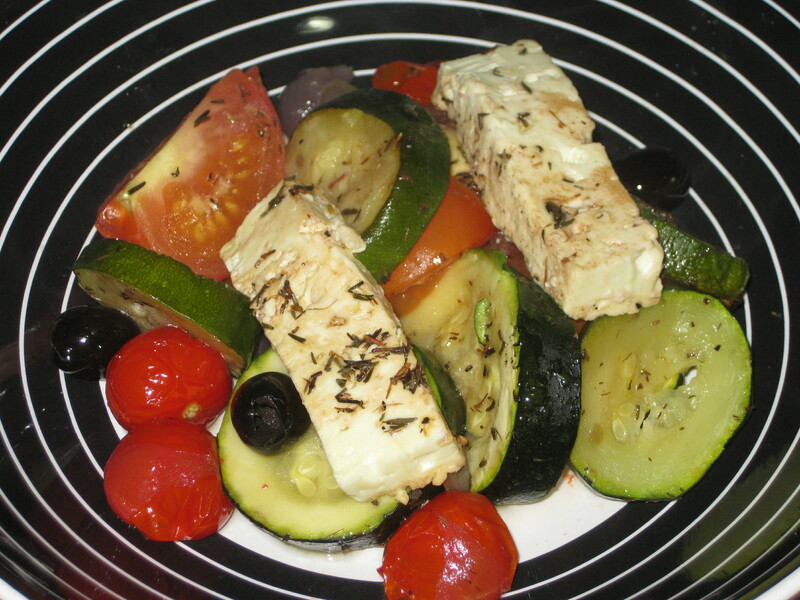 Cut the feta into 1cm slices and place in a dish. Mix together 1 tbsp olive oil with the vinegar, lemon juice and half the thyme. 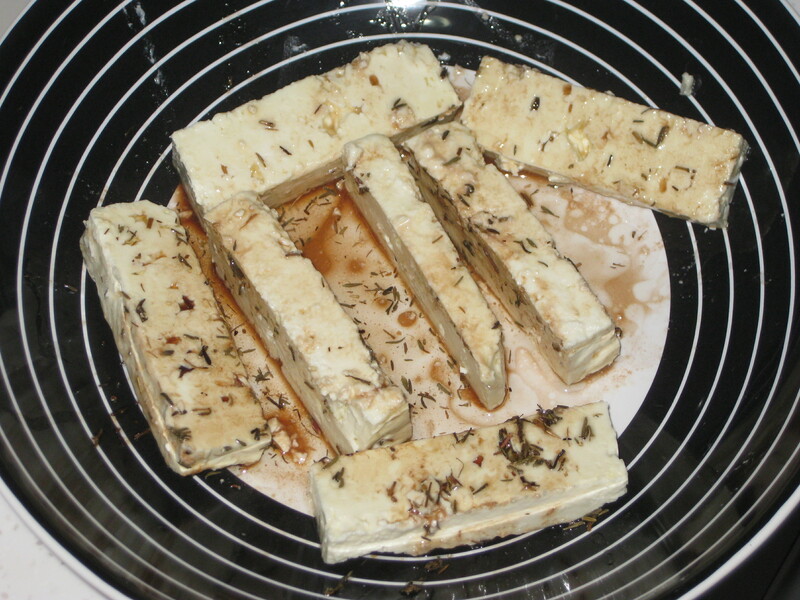 Season, pour over the feta and leave to marinate for 1 hour. Preheat the oven to 230C. 2. Meanwhile, prepare the rest of your vegetables. 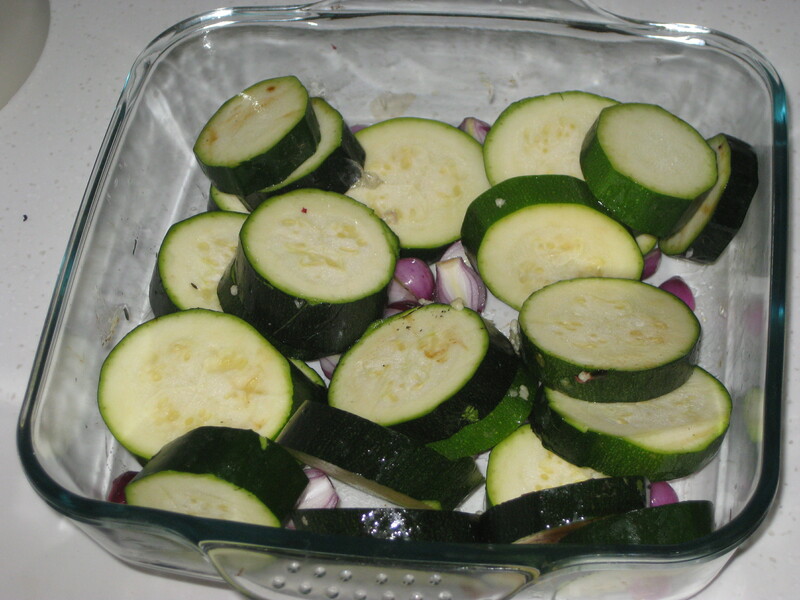 Place the courgette, garlic and onions in a roasting tin and drizzle over the remaining 1 tbsp olive oil. Mix to coat everything. Cook for 30 minutes, turning once. 3. 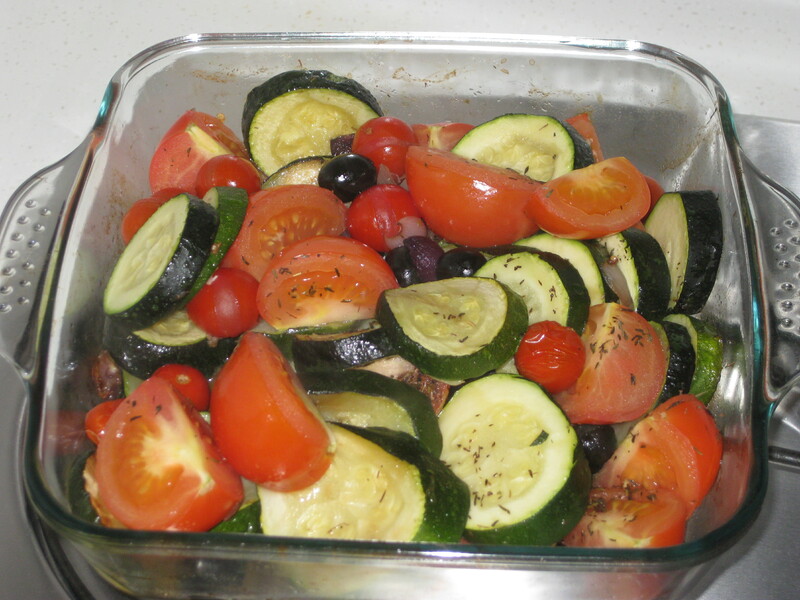 Add the tomatoes, olives, remaining thyme and some black pepper, and cook for 10 minutes more. 4. 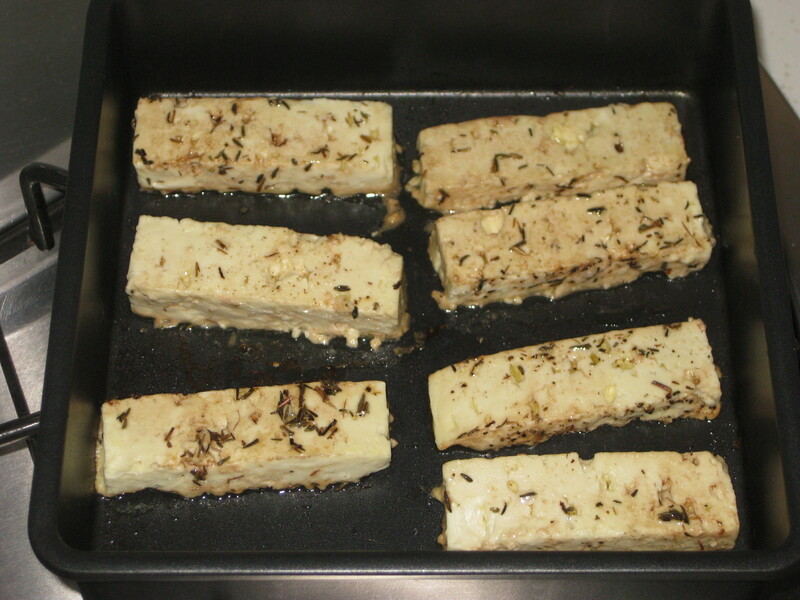 Remove the feta from the marinade (reserving the liquid) and place it on a baking sheet. Cook for 5-7 minutes. 5. Transfer the roasted vegetables to individual serving plates (use a slotted spoon to avoid too much liquid getting on the plate) and spoon over the reserved marinade. Top with slices of feta cheese. 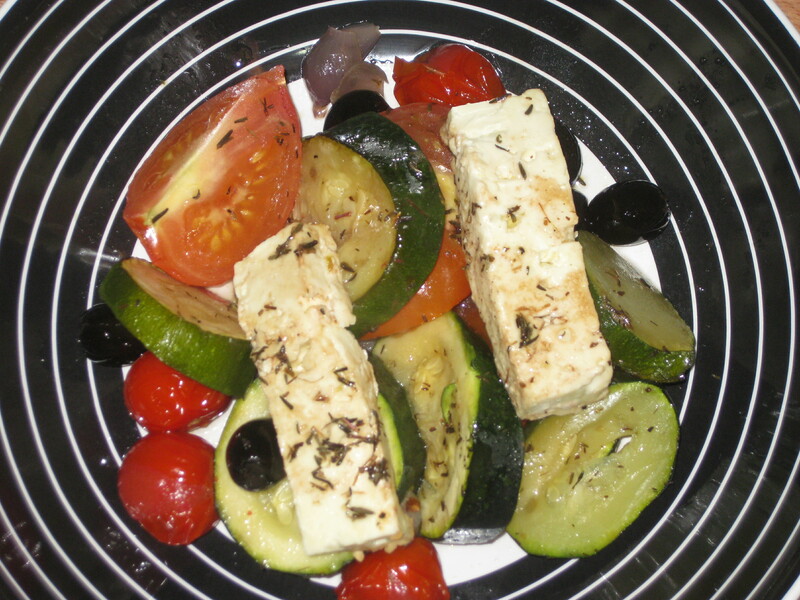 This entry was posted in Vegetarian Recipes and tagged Greek salad, roasted Greek salad, summer salad. Bookmark the permalink.